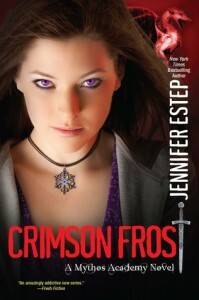 Crimson Frost is the fourth book in Jennifer Estep’s Mythos Academy series. This is a YA series and it’s really quite good. I know what you’re thinking: “But Julie, how do you know it’s quite good seeing that you don’t usually read YA. 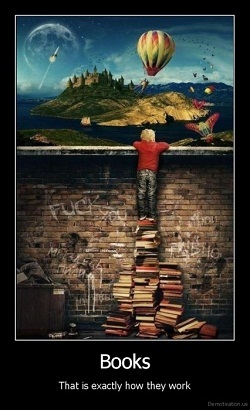 In fact, you’ve pretty much stopped reading YA all together lately!” Exactly! Don’t you see?! That is how you know that this series is good because it is the only YA series that has managed to keep my attention making it the only one I still read. I’ve pretty much given up on the other YA series I was following – they just couldn’t keep my attention anymore. But this one? This one is a crazy ride and really unique. It is set in a school and sometimes I find myself smirking at the ‘teenage drama’ that is referred to but it’s never too much. It never gets to the point where I find myself reading with the soundtrack to The Breakfast Club humming in the back of my head or where I want to pull out my neon yellow tights and hot pink leg warmers. It never gets too young. The series follows Gwen as she attends Mythos Academy, a school where the supernatural train and hone their skills to fight the Reapers, a.k.a. the bad guys. No, we are not talking about werewolves and vampires – we’re talking Valkyries and Spartans and other such forces. These are descendants from the warriors of times past and they are still fighting to protect the world, working with gods and goddesses such as Nike to fight the not-so-nice gods and goddesses such as Loki. The last book, Dark Frost, really surprised me. Up to that point, we had witnessed Gwen and her friends trying to curve an evil plan to set Loki free which would bring on a terrible war – one that was already fought years ago and ended with many lives lost and Loki being imprisoned. I always assumed that the whole point of the series would be seeing how they stop Loki from gaining his freedom. Well, nope. Boy was I was wrong on that count. Loki actually managed to escape in the last book and Crimson Frost shows us what happens next. Gwen is unique in her special ability. She can see the story behind a person or an object just by touching them. This makes her self-conscious and she tends to feel like an outsider. She’s not a strong fighter like the other students. She’s actually been raised not knowing that the world that she is a part of even exists. But she is getting more comfortable with her role and just more comfortable in her own skin. The Gwen from book one is slowly getting stronger and more confident which is great to see. She is facing some pretty heavy threats but she’s not taking them lying down. She isn’t seeing herself as a victim anymore which is great. I am so glad that she is gaining the confidence she deserves. Jennifer has written a beautiful character in Gwen and her growth from book to book is one of my favorite parts of this series. We also have Logan, who is finally Gwen’s boyfriend in this installment and who is all the yumminess a teenaged love interest should be. He’s smart and confident and not a jerk. He treats Gwen well, which is important to see in a YA book. Just because you’re a teenage boy it doesn’t give you permission to treat girls like they are tools on your quest to prove your cool factor. Logan is fiiine and a great addition to the series. And the ending (which he is directly and very importantly involved in) is heart breaking. Not totally unexpected but heart breaking just the same. 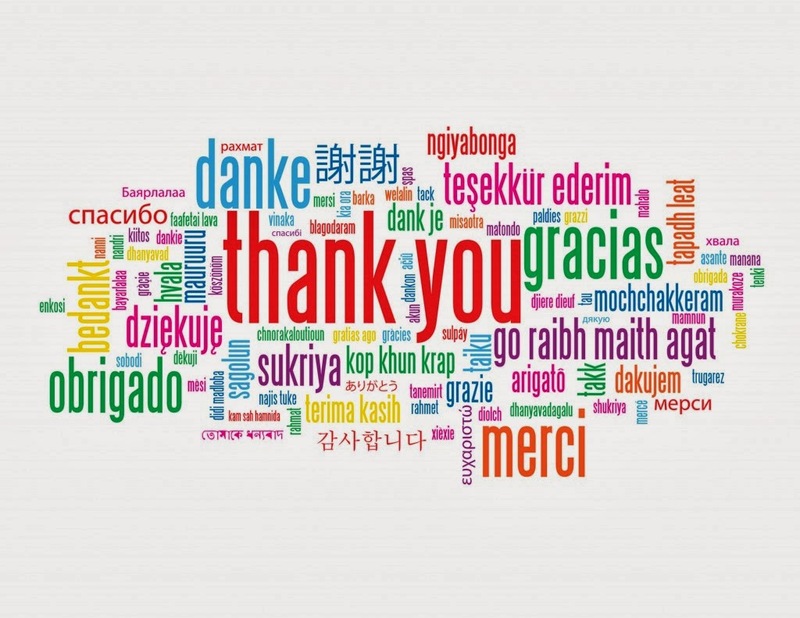 Gwen’s circle of friends and supporters (staff members who have taken her under their wing) are great, as always. They melt into the story and play an excellent supporting role in this installment. It’s the new characters that really stand out. They stand out by being total…meanies. Oh yeah. I went there. After what happened with and to Gwen in the last book, she gets arrested for aiding in Loki’s escape. What?! Ridiculous, right? And who else but Logan’s dad is in charge of the investigation. She comes across as already having an opinion of our Gwen and it is, unfortunately, not a favorable one. Really and honestly, Linus Quinn is a douche ball. I hated him so much, which proves that Jennifer wrote him very well. We eventually find out why Gwen was accused and who is behind it and all that jazz and whoa I could not have seen any of that coming! It really was clever how it all twisted and turned and all came together. All in all, I enjoyed the ride that was Crimson Frost. 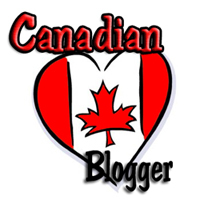 There is always some repetition – as that is how Jennifer writes – but it wasn’t bothersome. This series continues to fascinate me with its wonderful cast of characters, unique premise and go-go-go pacing. If you are a fan of YA, it is definitely worth a read. Midnight Frost, the fifth installment in the series, is due out in August 2013 and just from reading the blurb, I can tell it will be just as much fun as this book was. 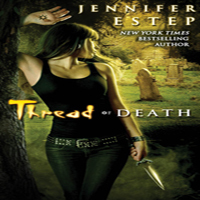 Share the post "Review: Crimson Frost by Jennifer Estep (Mythos Academy #4)"
I just finished this one over the weekend. I think it’s one of my favorites. I just adore this series.